While it can be a ton of fun to shoot your friends in your backyard, you're going to need a little bit more than some half-cocked safety goggles and a spring gun if you want to play an official airsoft game. So, what's included in an official airsoft gear? In this guide, we've compiled the essential list of airsoft gear and equipment you need to get out on the field. There are some basic essentials you're going to need. Most fields aren't even going to let you play without the basic safety gear, and it is better to have your own gun than to have to rent one. What equipment you really need largely depends on the role you'll be playing in the field. You're looking at making sure you have at least the following. Most people will want at least two guns while they're in the field. Your primary gun is the one that you're using the most. For most fields, an AEG rifle is the right choice, but you may want to go with an AEG submachine gun if you're going to be fighting in close range. If you're a dedicated marksman, then you'll have a single shot airsoft sniper rifle of some type. Most of these are spring, but some people choose to use an electric gun for their sniper rifle. The main things to look for are accuracy and high rate of fire. Even on fields which ban burst or full-automatic, you want to be able to dump a lot of BBs downrange with as little time in between as possible. Speed softers most frequently use high-pressure air pistols and forgo a traditional sidearm due to the nature of the sport. Your primary arm is most likely going to be the most expensive piece of your gear. You may also want to get a sling for your rifle or SMG. This will allow you to take your hands off it without dropping it entirely in case you need your sidearm or to use your hands to climb, vault, or otherwise move around your chosen arena. Before you invest in an AEG, make sure to perform a complete research. They can be an expensive purchase, and you'll want to make sure the one you have is right for your play style and position. A sidearm is a good idea and making sure you have a good holster is pretty much essential. Often people prefer to use gas blowback pistols, but some dedicated marksmen pick up an HPA pistol similar to what speed softers use or an electric automatic pistol. Both are a good choice for those whose primary weapon has a slower rate of fire. Thigh and waist holsters are the most common. They keep a pistol out of the way and allow you to get your hands on it quickly when you need it. Most people will want multiple magazines for their weapons. Even with speedloaders, it takes a considerable amount of time to reload a magazine while you're in the field. A good strategy is to become better in field is to bringing 50% additional set of ammunition. You'll be in good hands in case you get into a tight spot and need to really unload. Most people will do well with 3-4 extra magazines for their primary arm and 1-2 extras for their sidearm. The number of extra magazines you're carrying may vary depending on the role you're playing on the field and the length of the games you're engaging in, however. You need to keep your face protected. Your eyes are especially vulnerable to real damage from airsoft BBs. Some people opt to just use goggles. Some fields will even let you play with just a good pair of goggles which close around the sides. We don't recommend going this route. Others use paintball masks. They have a tendency to fog up, but they provide full face protection and will keep you from getting nasty welts or bruises if you get shot in the face. Perhaps the most common method is to pair goggles and a lower face mask. 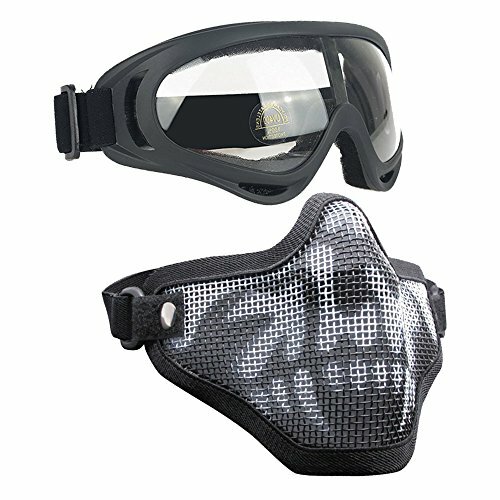 Usually, the lower face mask will be made of mesh. Ideally, it'll also cover the ears, but this isn't always the case. If you do choose to use just goggles, and it's allowed where you're playing, then you'll also want to pick up a soft face mask of some sort to help keep things protected. Your ears, eyes, and nose are the most vulnerable parts of the face to real damage from airsoft pellets so take extra care to protect them. More casual players will sometimes play with just jeans and a long sleeved shirt. This provides a bit of protection, but it's not the best way to go. BDUs are also common on the field. They have a lot of pockets, and the reasonably thick material provides quite a bit of protection from airsoft BBs. Combat shirts are also common. We recommend finding some cargo pants that let you move well. You'll be very thankful for the extra pockets to hold magazines and other gear while you're in the field. Choose one that's easy to clean and maintain. As long as you have the above, you'll be able to do pretty well in the field. Some of the following items are used by many players, however, and they can make things a lot easier on you. LBE Gear - Chest rigs, utility belts, or even MOLLE vests are frequently used by players. These will let you keep your extra magazines and anything else you might need close at hand. A cheap chest rig should work for most players, but being able to customize a MOLLE vest is pretty cool even if it is an expensive choice. Gloves - Full finger gloves are very nice to have. While not as vulnerable as your face you'll find that getting shot in the hands hurts quite a bit. Tactical gloves can be found fairly cheap and provide a good amount of protection. Hydration Pack - While they're mostly used during games on a very large field, a good hydration pack can be an absolute lifesaver. Rather than having to stop and grab a bottle you'll be able to just pull up the hose. Boots - A good pair of boots can be a lifesaver in the field. While you're unlikely to need the extra protection from BBs for your feet they'll allow you to move through rough terrain easily. With a stiff ankle, you can also avoid damage if you stumble while under fire. Hat - Hats can keep the sun out of your eyes so that you have less trouble firing at people who take advantage of approaching with the sun at their back. They also provide a bit of protection from BBs. Some people opt for helmets instead. Bandanna - A good bandanna can help to keep sweat out of your eyes. This avoids the stinging as well as allowing you to keep your goggles from fogging. Extra Battery - If you're laying down a lot of fire from an electric gun then you're probably going to want an extra battery. Most fields don't have a place to recharge, and no one wants to be out for an extended period anyway. Knee Pads - Many players use knee pads. It's often better to fire from a kneeling or crouching position than when you're standing, and they can be an absolute lifesaver during a long match. Basically, you want to be prepared for the field you're in. Extra protection, snacks, water, and other items are pretty variable depending on how long you're planning on playing and what the rules of the field are. When you make sure you've got the right airsoft gear for your field you'll be in much better hands. If you want to play an official airsoft game match, gear selection is very important. Always remember, always protect yourself. Fun is secondary, safety is the priority.